Crestron Connected devices, which feature a chic and modern design for Crestron's smart home systems. LED light identification: Crestron's system can fully control the variety of options on each touch button. press / release / short press / long press / double press. VTouch Cresnet keypads feature a wide variety of elegant glass colors available in standard or matte finish including customized glass panels for each home or office setting. Locate keypads in the dark with surrounding blue LED light. Enjoy full control of surrounding light’s intensity. Choose between standard or flush mount installation. All keypads are available in American single or double gang standard and include between 1 to 16 keys. Complete interior design with matching glass frames for sockets and matching glass touch thermostats. Not sure if you remembered to close the blinds before you left the house? Just shut them while on the go. Illuminate your garden for the perfect outdoor setting or set them to come on every evening at sunset. Without having to get up, easily dim the lights low for movie time. As you leave the office, turn on your AC and warm up the house, so that by the time you return home you can enjoy a nice and warm environment. These stylish keypads can be installed floating above the wall or flush to it and the color of the glass switch can be customized to compliment your interior design. VTouch Cresnet connects seamlessly with appliances in your Crestron systems so you can control your home 24/7 in an exclusive way. Controlling electronic appliances from your stylish customized glass touch keypads has never been easier. VTouch Cresnet simple "plug & play" installation and configuration, replacing your existing mechanical looking keypad is easy. You can effortlessly install the keypad that clicks on to the wall. Vitrea uses only the highest quality components to ensure maximum reliability and dependability. 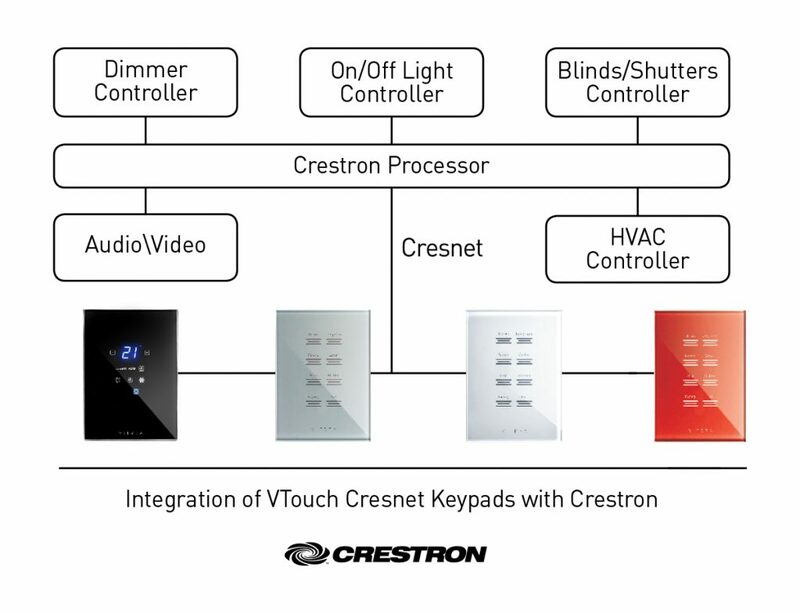 When you're ready to enjoy a unique smart home, upgrade your current mechanical looking keypads to VTouch Cresnet, Vitrea's new design for Crestron smart homes.